The substantial growth in New York’s nonprofit human services sector has come in response to a host of social, demographic, and economic changes. The State and its local governments have turned to nonprofit organizations to provide critical services for many populations, including children and those with low incomes striving to enter the middle class. Millions of New Yorkers are directly served, and all New Yorkers reap the benefits of more stable communities when their neighbors are able to pursue healthy and satisfying lives and seek better opportunities. These essential human services, however, come at a cost, and they should be paid for—in their entirety—by government. These are public services, provided in keeping with New York’s constitutional requirement (Article 17: “the aid, care and support of the needy are public concerns and shall be provided by the state …”) and legislative determinations. The nonprofit human services workforce is, in effect, an indirect government workforce. Given their charitable missions, nonprofits have readily stepped forward to accept this public service delivery responsibility. However, New York State has not held up its end of the bargain. The underfunding of human services is a serious and growing problem. Most State human services contracts have not been adjusted for rising costs in many years. Reimbursement rates for many Medicaid-funded services have been adjusted to increase pay rates for workers, but the same cannot be said for most human services contracts. (New York City has funded significant wage increases in its contracts for nonprofit human services workers.) Over the past six years, the State has steadily reduced the inflation-adjusted funding levels for human services spending that funds contracts with nonprofit providers and that provides funds to local social services districts that in turn contract out services. The nonprofit workforce has borne the brunt of the State’s funding failure. Despite the fact that these workers are highly educated they are some of the lowest paid workers in the New York economy. Most nonprofit human services workers make less than those in retail trade, and most workers caring for young children are paid about the same as the average restaurant worker. New York’s human services employment has doubled since 1990, increasing from 166,000 to 332,000 in 2016. In New York City, it rose by 82 percent, while the suburbs and upstate together saw 129 percent growth. Human services job growth occurred primarily among nonprofit organizations working under public contract, and was 21 percent of all private job growth in the suburbs and upstate, and 10 percent of New York City’s private job growth. Average annual pay for human services workers ranges from $23,000 to $25,000 upstate, about $27,000 in the Hudson Valley and on Long Island, and $29,600 in New York City. Such pay is only about 40 percent of the average pay for all workers and falls far short of the income needed to meet United Way’s survival family budget needs. Human services workers are overwhelmingly women (over 80 percent) and heavily women of color (44 percent of the total). They are well-educated—41 percent have a four-year college degree and another 25 percent have an associate’s degree or some college—and most work full-time or close to full-time schedules. Inadequate pay is not just a problem for the lowest-paid human services workers. Average pay for middle-tier occupations such as social workers and substance and drug abuse counselors is 20-40 percent greater in hospital, school, and civic organization settings than in primarily government-funded nonprofit human services providers. Across New York, preschool teachers are paid 74 percent more in public schools than in nonprofits. Among New York’s largest nonprofit human services providers, 80 percent have budgets that are 90 percent or more dependent on government funding. While charitable contributions have risen over the years, they rarely account for more than 10 percent of service providers’ budgets. An extensive 2015 survey of nonprofit service providers found that 44 percent say that State contracts never cover the full cost of providing contracted services and another 16 percent said the State rarely covered the full costs. 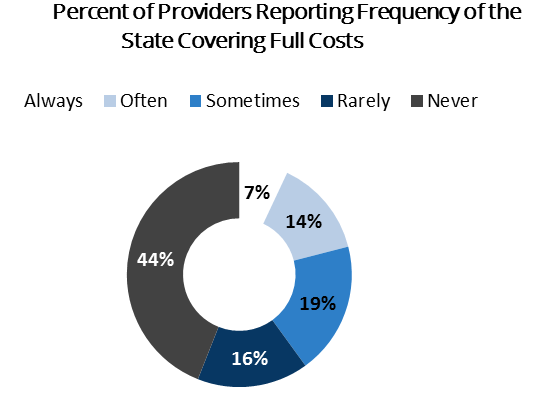 Only seven percent reported that State contracts always covered full costs. Another survey tied the systemic underfunding of government contracts to the fact that 18 percent of New York human services nonprofits are financially insolvent. The low pay and paucity of fringe benefits translate into high and costly turnover for nonprofit organizations providing public services under government contracts. Pay is so low that 60 percent of those working in the sector were utilizing or had a family member utilizing some form of public assistance benefit such as Medicaid or food stamps. As the $15 per hour minimum wage for fast-food and other workers is phased in, recruitment and retention of dedicated and caring human service professionals will become an even greater challenge for nonprofits struggling under the weight of severely underfunded State government contracts. If the State’s spending on human services contracts and social welfare funding for local governments had continued to grow during the recent years of recovery from 2011 to 2017 at the modest 2.1 percent annual pace that occurred in the four-year span from FY 2007 to 2011 (covering the recession and the immediate aftermath), proposed State human services spending in the coming year would be about $1 billion (nearly one-third) greater. Despite the gradual overall recovery from the 2008-09 Great Recession, economic hardships remain at elevated levels, particularly in much of upstate. Since the recession, the number of New Yorkers receiving food stamps has increased by 76 percent outside of New York City, and there has been a one-third increase in households turning to Safety Net public assistance. The demand for greater publicly funded human services remains at high levels, particularly in communities by-passed by recovery and broad-based growth. New York State should increase funding in human services contracts (directly and for those contracts administered by county governments) so that labor compensation begins to adequately reflect the education, experience, skills and commitment of this predominantly female workforce. At a minimum, the 2017-18 State budget should include funding to raise all nonprofit human services contract workers to the statewide $15 per hour minimum wage, following the timetable laid out in the State’s 2016 minimum wage legislation. In addition to adequately funding the human services workforce, New York State should set its nonprofit contract funding rates to cover the real costs of providing public services. The precarious financial condition of a growing number of human services nonprofits is clear—and it is equally clear that this precariousness is largely the product of underfunded government contracts. New York State needs to address economic hardships at a community and family level, both upstate and downstate. The elevated levels of child poverty and the increased reliance on food and public assistance are hard to square with the State’s human services funding retrenchment during a period of economic recovery. The State has made modest investments in beginning to address poverty. However, this is a case where modesty is not a virtue. Dr. James Parrott is the outgoing deputy director and chief economist of the Fiscal Policy Institute, an independent, nonpartisan, nonprofit research and education organization committed to improving public policies and private practices to better the economic and social conditions of all New Yorkers. This is a slight revision of the executive summary of the recently released report “Undervalued and Underpaid: How New York State Shortchanges Nonprofit Human Service Providers.” The report was published by “Restore Opportunity Now,” a campaign bringing together more than 340 human services organizations across the state.